Travelling has downsides. Especially when coming back to the office to catch up with all the tasks being actively postponed. One of them has been sitting here for too long: It took me a while to get this latest review for Packt Publishing out the door. But this is the good side of traveling, you have plenty of time to read and educate yourself on topics. WildFly 8 is a modular, lightweight, Java EE-compliant application server. Application deployment and management is simplified with WildFly's centralized and easy-to-use administration interface. It supports high availability and latest web technologies, such as web sockets and a non-blocking API. There was previously a lack of a system-administration-free platform that allowed the scaling of Java EE applications, but WildFly 8 in combination with OpenShift fills that gap. Christopher Ritchie (@ChrisRitchie123|blog) is a Sun Certified Programmer with over 10 years of software experience. Having worked in both the UK and South Africa markets, he has worked on a variety of software applications, ranging from online gaming to telecoms and Internet banking. He has a keen interest in the WildFly application server and is an advocate of Java EE technologies. He currently works as a technical lead at the company he confounded, Sports Science Medicine Software, in South Africa. The company's core product is a research-based application that allows the profiling of soccer players through injury and exposure assessment. 353 net pages without intro and appendix is a good deal for this book. 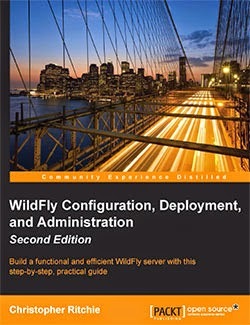 Eleven chapters cover nearly every aspect of WildFly. This includes basics, like installation and goes all the way to cloud computing with WildFly on OpenShift. The separate chapter on securing WildFly is my personal highlight here. The book was build on top of WildFly version 8.x which fully supports Java EE 7 development on top of Java SE 7. Generally the instructions are clear and the many screen-shots are helpful. The overall level of detail and mixed in complexity is appropriate and in case you need it you can download the source code from Packt. I like the clear English writing which identifies the author as a native speaker. I would have wished for more command line examples and a little less XML snippets. The conceptual pictures in the book could be a bit clearer and bigger. But this is pretty much everything I have to criticize. If you are looking for a most complete introduction and you're tired about trying to find the bits and pieces in the online documentation, this book is for you. Also, if you are the kind of person which needs examples and screenshots this book is for you. The very appealing writing style helps in getting all the points across. The unique selling point obviously is the end-to-end coverage of all related topics in a detailed enough way to let you experience WildFly installed locally and on OpenShift.